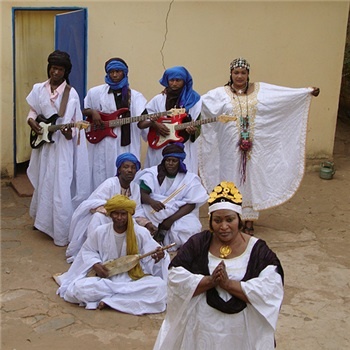 MP3 of the Day: Khaira Arby, "Dja Cheickna (Live @KEXP)"
A cousin of the Farka Touré family, Khaïra Arby took Mali's national music competition by storm in 1970 when she was just eleven years old. But despite her gift for song, she soon found herself given to marriage with a man who forbade singing. After years of frustration, Khaira Arby divorced to embark on a career in music. She joined Mali's national band and blossomed into a renowned solo artist in the 1990s, known as "The Nightingale of the North" to the south's "Songbird of Wassoulou," Oumou Sangaré. On the heels of her first international release, Khaïra Arby visited the KEXP studios in Seattle for this live performance on The Best Ambiance with Jon Kertzer. She performed with her band from the deserts north of Tombouctou, Kevin Suggs with songs in the Sonrai, Arabic, Tamashek, and Bambara languages of the Sahara. Video after the jump, with more on KEXP's blog. If you like your hip-hop rough, rugged, and real, make sure to keep tabs on Diamond District. Based in Washington, D.C., their debut album In The Ruff has been catching the ears of those that lean towards the '90s production style of the genre. Longtime producer Oddisee is joined by X.O. and YU on the microphone, each spitting gritty rhymes over grimy beats reflective of present-day D.C.
Stanton Moore is best known for being a founding member of legendary New Orleans funk band Galactic. Away from this, he has a solo career which spotlights him as all-round inspiring musician, innovator and teacher. His dedication to funk drumming is surpassed only by the love of his home, New Orleans, where jazz was created and where people like him are investing their time and talents to keep it as vibrant as ever. In April this year he released the book 'Groove Alchemy', an essential investigation into the original elements of funk and groove drumming. He gives invaluable insight into how his drumming is turned to gold: combining masterful, experienced rhythms with the characteristic laid-back lilt of New Orleans. The release of this book reflects the type of musician Moore is. From providing masterclasses in the Big Easy drumming style, to introducing his own titanium snare drum, to setting up a scholarship for young aspiring musicians post-Katrina, Moore's heart and soul are truely backing every beat he makes. Banner Pilot - "Isolani (Live @ KEXP)"
Dale Earnhardt Jr. Jr. - "Skeletons (Live @ KEXP)"